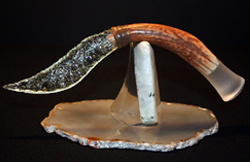 EXTREMELY LIMITED, ONE-OF-A-KIND, HAND CRAFTED KNIVES AND KNIFE SCULPTURES MADE FROM PRECIOUS AND SEMI-PRECIOUS STONES AND MINERALS. FOR COLLECTORS AND INVESTORS. 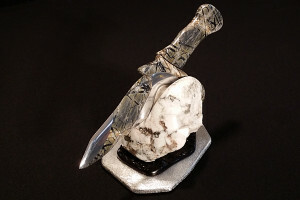 EXCLUSIVELY SOLD BY KNIVES IN STONE. 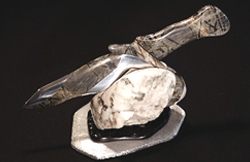 Knives in Stone …transforming earth’s natural elements creating exciting and elegant contemporary masterpieces. 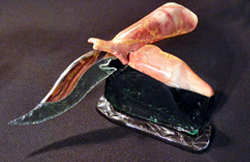 Through his obscure imagination artist Mario Marcella creates the world’s only one of a kind contemporary masterpieces, sculpting exquisite museum quality gemstone knives. For the first time artist Mario is making available for sale a limited quantity of the finest gemstone Knives from his personal collection. 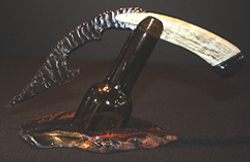 Mario’s beautiful knife Sculptures are personally signed and come with a certificate of authenticity. These are exquisite collectable works of art for the discerning collector.